There are some books that I love so much and I want to share with the teens, yet no matter how many times I display it or booktalk it to classrooms, the book doesn't move. So what's a librarian to do? That's when I handsell the books. Now, I don't think that's a terrible cover, but for some reason the teens find it boring and never want to pick it up. So when a teen asks for suggestions about a book to read, I always suggest Airborn. I tell the teen about the book (It's like Treasure Island meets Around the World in 80 Days with a bit of Pirates of the Carribbean and airships!) I gush about how it's all about adventure and there are strange creatures that an old man claims that he saw but now else believes him except his granddaughter who claims to have proof and won't cabinboy Matt help her out? I tell them about how I want to know what they think of it and they should read it and come back and tell me about it-and if they hate it-that's OK too-I just what to know what they think. I love booktalking books and when I get a chance to handsell some of my favorites to teens it makes my job even more fun! 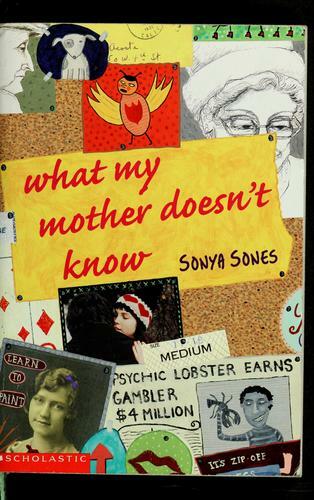 Sleepless by Terri Clark "trust me-it's full of mystery and suspense"
What My Mother Doesn't Know by Sonya Sones-"what would happen if you fell for a quiet not popular kind of outcast boy?" I know I'm not alone in this-what books do you have to handsell to your teens? Well, from your description of Airborn, I put it on my to-read list. I've seen it in the library a lot and have passed over it myself. Thanks! I actually picked up the Airborn playaway from my library recently. It was your review on Goodreads that convinced me to try it. In fact when I posted my In My Mailbox I quoted your review. So far (I'm about 1/2 way through) I love it. It's everything you said it would be. I've had to hand sell Scott Westerfeld's Levithian series. The covers do nothing for my teens but I love being able to talk up the steampunk aspects of it and the great illustrations. Anon-YAY! I hope you love it! Juju-That just made my day! :) I loved it on audio-it was so good! Sarah-Those don't check out at my library either and require a lot of handselling. Maybe it's the steampunk genre that needs the most help? I looooved What My Mother Doesn't Know. And I'm not a librarian, but I love reading your posts about your job. It's so obvious that you love your work! I have to handsell my Lois Duncan books and Mary Downing Hahn because they have bad 80s covers. When they read one they come back for all the rest. Airborn was one of the books read for my library system's Battle of the Books last year and my whole team LOVED it and still talk about it today. 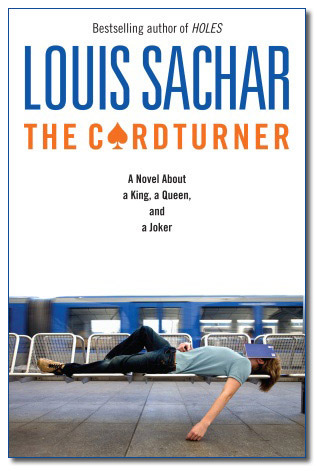 The Card Turner is funny to me because though I loved Holes and at this point in my life would love to learn how to play bridge, as a kid I thought bridge seemed so boring - I mean if my parents played it once a month it had to be right? Still need to read that one. AND learn how to play bridge. And form a bridge group like my super cool not-so-boring parents. I handsell Michele Jaffe's "Bad Kitty" because the cover is..not my favorite, but the book is so funny and cute and amazing and mysterious. I love Airborn!!! No one has been able to sell The Cardturner to me yet... I just can't get past the fact that the whole thing is about a card game. I had a group of girls at my old school who looooved Sonya Sones. I think it was partially because poetry had suddenly become a very trendy, "mature" thing to scribble all over your notebook, so they loved the idea of whole books written in verse. I am so guilty of that. Question for you - I keep hearing how teen boys don't actually read. As a librarian, what's you personal experience around that?